Governments and the public should insist that the rich pay more in income and wealth taxes – indeed, a lot more. The upward re-distribution of the past 25 years has made our economies into extravagant playgrounds for the super-wealthy. Politicians of both the mainstream left and right in the US and UK have fawned over those who pay their campaign bills in return for low taxation. Even playgrounds should collect tolls – when it is billionaires in the sandpit. I don’t think this is possible, politically, in either the US or the UK. In the US, the middle classes are implacably opposed to tax hikes on people making more money than they themselves will ever make. I’m not entirely clear on the reasons for this, but I suspect it has something to do with the American Dream of becoming incredibly successful: no one wants to reach that gilded land only to find it full of taxes. And in the UK, the Tories have moved far enough to the left already, both before and after the election: there comes a point at which the parliamentary Conservative party simply won’t get dragged any further in that direction. Someone — a journalist or an academic, I’m not sure which — should consider this an assignment desk piece: Why are Americans so unsympathetic to higher taxes on zillionaires? Does it really have something to do with an unfounded optimism about themselves someday becoming rich? I’ve heard this explanation a thousand times, but there’s really never any evidence for it except for one thing: an old poll (which I can’t locate just at the moment) showing that 19% of Americans think that someday they’ll be millionaires. The problem is that (a) it’s just one poll and (b) it’s still only 19%. If that were really the reason Americans were opposed to taxing the rich, we’d still have about 80% of the country in favor. So what is the reason? The “American Dream” answer is one possibility. Generic anti-tax fervor is a possibility. A principled sense of justice (i.e., no one should have to pay more than half their income in taxes, or some such) is a possibility. Widespread delusion about how much the rich currently pay in taxes is a possibility. There are lots of possibilities. But which of these are actually the prime motivators? Someone should try to find out. When they asked about raising income taxes on households making more than 1 million dollars, support was overwhelming, 72 of respondents including a majority of self-identified Republicans said it was a good idea. Felix Salmon thinks that middle class U.S. voters will prove resistant to tax hikes on the rich. Like Matt Yglesias, I think he’s wrong about that. The median voter seems entirely content to tax other people more heavily, as you might expect. Leaving aside Sachs’s implicit mental model of the working rich — suffice it to say, I think I have a different mental model — taxing the rich is a strategy that yields diminishing returns, as Megan McArdle recently explained. But the larger problem is that whether we feel for them or not, as noted in an essay one of my commenters pointed to, a 50% marginal rate seems to be where people get really, really serious about tax avoidance. Paying more than half their income in taxes violates most people’s sense of fairness. More importantly, the higher the marginal rate, the bigger the payoff from tax avoidance–and the more you can afford to pay smart tax lawyers while still coming out ahead yourself. Perhaps Sachs would advocate some form of tax harmonization to help mitigate this outcome. But my guess is that technology will make tax evasion less difficult rather than more difficult over time. This suggests that heavier consumption taxes are a far more likely revenue source. And when the alternative is taking a hard look at public spending in search of efficiencies or reducing net disposable income, my guess is that the politics of budget-trimming will gain potency in the decades to come. In the elite debate it is definitely agreed that Americans hate class warfare and are not willing to soak the rich. I firmly believe that this is agreed, because it serves the group interest of the elite. I don’t think Drum, Salmon or many others are influenced by their personal self interest (Drum and Salmon clearly wish things were as they really are). I think the fact that the US public want to raise taxes on the rich isn’t transmitted from pundit to pundit the way the alleged fact that Americans want Obama to show more anger at BP is transmitted, because critical links are broken by people who just hate the fact and won’t accept it. I add that admitting that Marx had a point makes me feel ill.
Kevin Drum and Felix Salmon ignore not only massive evidence but also my many posts pointing to that massive evidence. My feelings are hurt. Not to boast, but just to boast, I have actually corresponded by e-mail with Drum and by some kind of instant messenger with Salmon. As I mentioned before the jump, Matthew Yglesias pointed out that their perception of public opinion is totally inconsistent with public opinion. Here’s the link again. The very best fact is that 64 % of polled American adults with annual household income over $250,000 think that “raising income taxes on households making more than $250,000 should … be a main part of any government approach to the deficit”*. Drum and Salmon’s amazing disconnect from reality is not based on the inflation of the concept of “middle class” which now seems to mean “upper class but not super rich” and goes from the 50th percentile up to the 99th or something. By that definition, most middle class respondents agree with rich respondents that taxes on the rich should be increased (perhaps conditional on there being spending cuts and other tax increases). 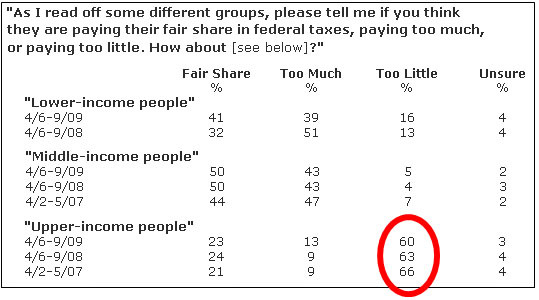 *In plain numbers this would seem to be 16 out of 25 rich respondents favor increasing their own taxes. That gives a standard error of the estimate of 9.6% so the two standard deviations interval would be from 44.8 % to 83.2%. This calculation makes no sense with such a tiny sample. The null that 50% or less of the rich support higher taxes on the rich is not rejected at the 5% level, p = 8%. The null that 40% or fewer of the rich support higher taxes on the rich is rejected at the 5% level the p level for the null of 45% is almost exactly 5%. The rich want to soak the rich. I’ve condensed the full report, but basically it shows that large majorities have felt that upper-income taxes are too low since at least 1992 — though that majority has dropped considerably during that time (from 77% in 1992 to 60% in 2009). It’s also worth noting that essentially nobody thinks that they, personally, are paying too little federal income tax. Still, there you have it. Soaking the rich isn’t the electoral loser I made it out to be. So then the question becomes: why is Congress unable to reform the estate tax, which affects only the very tippy top of the super rich? Why are negotiations over the carried interest loophole, which affects only zillionaire hedge fund managers, retreating from 100% repeal to 75% repeal to 65% repeal? The answer, of course, lies primarily in the ideology of the Republican Party, aided and abetted by the ideology of “centrist” Democrats, which is strong enough to overcome public sentiment. So then, how about this question instead: Americans apparently are sympathetic to higher taxes on the rich, but equally apparently, they don’t really care very much about it. They don’t care enough, anyway, to sway their elected representatives much. How come?